Baltimore Orioles’ first baseman Chris Davis continues to lead the major leagues in home runs, hitting his 46th last week. At his current pace, it won’t be long before he’ll hit his 51st, breaking the franchise record currently held by Brady Anderson. What does any of this have to do with hockey? Nothing, in theory. But it’s August and there’s nothing else to write about, so we’ll just go ahead and steal this story line from another sport and make it about hockey. So in honor of the soon-to-be-former Orioles record-holder, here are 10 of the greatest Brady Anderson seasons in NHL history. You have to hand it to Scott Bjugstad. It’s not easy to play in the NHL for nine years and record more than half your total career goals and points in a single season. Bjugstad somehow managed that feat during the 1985-86 season. That was the year Bjugstad — a Minnesota native who was in just his second full season — found himself playing on the North Stars’ top line alongside All-Stars Dino Ciccarelli and Neal Broten. The line clicked, and Bjugstad finished the year with 43 goals and 76 points. four, during an injury-plagued season that saw him demoted to the minors. 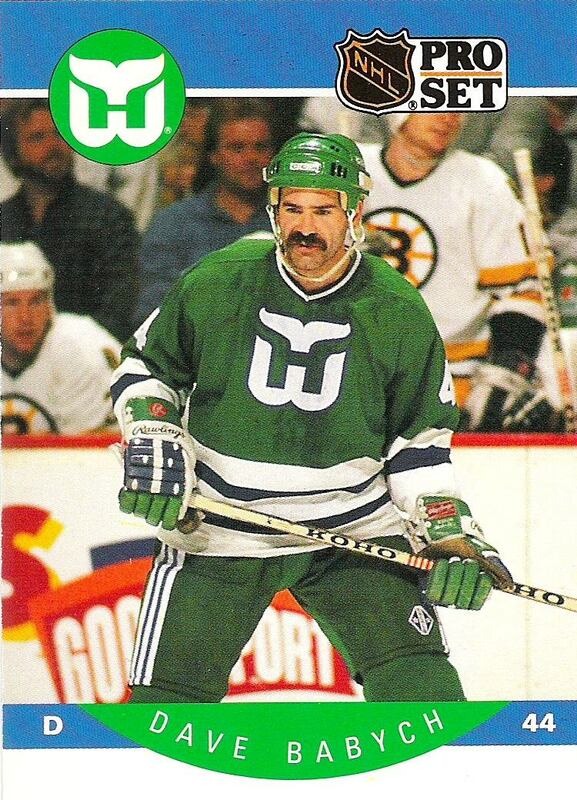 He’d stick around the NHL until 1992 but never put up big numbers again. Other than his one breakout season, the rest of his career combined looked like this: 237 games, 33 goals, 68 points. Bjugstad now runs a hockey school. If you sign up, be sure to insist on getting your instruction from the 1985-86 version. Many times, outlier seasons like the ones in this post are puzzling. What could have caused such an odd jump in the numbers? Was there a subtle shift in a player’s approach? His circumstances? Was it just plain luck? What, if anything, could cause such a onetime explosion? And then there’s the case of Warren Young’s 40-goal season with the Pittsburgh Penguins. It accounted for well over half of the 72 goals he managed over parts of seven NHL seasons. It landed him on the All-Rookie Team at the age of 29. And it’s just about the easiest mystery to solve in hockey history. You see, Warren Young wasn’t the only rookie forward on the 184-85 Penguins. They also had a first-round pick named Mario Lemieux who turned out to be pretty good, and Young got to play most of the season on his line. That wasn’t so much a tribute to Young’s talent as it was to the Penguins’ lack of options. Other than Lemieux’s 100-point campaign, the 1984-85 team was terrible. The other top-scoring wingers on that year’s team included Doug Shedden, Gary Rissling, and Wayne Babych (from whom we will hear again in a bit). So Young got the job by default, and had a career year. He turned that into a free-agent deal with Detroit, which traded him back to Pittsburgh after just one season. There would be no reunion with Lemieux, and Young managed just eight more goals in the final two years of his career. All of which makes you wonder: If playing with an all-time elite can result in a season like this for a barely average player like Young, what kind of numbers would a borderline star be able to produce? Oh, OK, there’s our answer. Bernie Nicholls was a good player for the Kings in the 1980s, recording 100 points in 1984-85 and coming within five points of the century mark on two other occasions. Heading into the 1988-89 season, he was riding a string of five straight years of 30-plus goals. That’s when Wayne Gretzky arrived in Los Angeles, and things got a little crazy. Nicholls didn’t just have a career year — he had one of the greatest years any player has ever had, recording 70 goals. That made him one of just eight members of the NHL’s 70-goal club, alongside names like Gretzky, Lemieux, and Brett Hull. And he did it while adding 80 assists, giving him 150 points on the year. Here’s the full list of every other NHL player who’s ever had a 150-point season: Gretzky, Lemieux, Steve Yzerman, and Phil Esposito. That’s it. Not Jaromir Jagr, not Mike Bossy, not Bobby Orr. Just those four first-ballot Hall of Famers and Bernie Nicholls. And unlike Young with Lemieux, you can’t even explain Nicholls’s year solely by pointing to Gretzky’s arrival. Both Nicholls and Gretzky were centers, so they didn’t play together often at even strength. But with opponents focused on trying to slow down The Great One (he finished the year with 168 points, winning his ninth and final Hart Trophy as MVP), Nicholls was apparently given free rein to fill the net. It couldn’t last, and it didn’t. Midway through the next season, the Kings dealt Nicholls to the Rangers. He finished that year with 112 points, but never topped 75 again, despite bouncing around the league for another decade. Early in his career, Jacques Richard seemed like a sure thing. In addition to having a practically perfect French-Canadian hockey name, he’d had a dominant junior career with the Quebec Remparts and was the second overall pick in the 1972 NHL draft. But Richard never lived up to his promise over his first seven seasons, in part due to a series of personal problems. His best season had been a 27-goal, 43-point campaign with the Atlanta Flames in 1973-74. He was later traded to the Sabres, but the change of scenery didn’t help. After recording just 25 points in 61 games during the 1978-79 season, Richard was released. With his career on the verge of ending, Richard got a chance to return home thanks to a free-agent offer from the Nordiques. After one part-time season, he found himself on a line with Paul and Anton Stastny in 1980-81. The trio exploded, with Richard racking up 52 goals and 51 assists. That 103-point season represented his career high by a stunning 60 points. Richard’s renaissance was short-lived. He was dropped from the Stastny line the next season, and was out of the NHL two years later. OK, I know this works better if we focus on offensive seasons, but Jim Carey’s first full NHL season has to find its way onto the list somehow. Carey’s rookie year came in the lockout-shortened 1994-95 season, and he played well enough to earn a spot on the All-Rookie Team. But it was the next year that he established himself as one of the best goaltenders in hockey, leading the league in shutouts, winning the Vezina, and being named a first-team All-Star. That’s a pretty good start to an NHL career, wouldn’t you say? That’s it. From being named the league’s top goalie to out of hockey completely in just four years. What happened? According to one version of the story, the Penguins (who beat the Capitals in the playoffs in each of Carey’s first two seasons) figured out that he couldn’t go side-to-side and used that knowledge to shell him; once the rest of the league caught on to what Pittsburgh was doing, he was done for. A less interesting explanation is that he was just never as good as we thought — even in his Vezina year, he finished just 15th in save percentage and benefited largely from playing behind a strong Washington defense. Joining Carey in our “rookie goaltenders as cautionary examples” section is Steve Penney, the rookie Montreal Canadiens netminder who was the talk of the hockey world for one regular season and one playoff run, though not necessarily in that order. Despite just four games of NHL experience (all losses), Penney unexpectedly found himself as the Habs’ starting goalie during the 1984 playoffs. He responded with one of the great playoff underdog runs of all time, posting a 2.20 goals against average to lead a very mediocre Canadiens team to upset wins over the Bruins and Nordiques before pushing the Islanders dynasty to six games in the conference finals. Penney followed that Cinderella run with a solid first full season that saw him win 26 games, record the league’s fourth-best GAA, and earn a spot on the All-Rookie Team. Based on his strong play and out-of-nowhere playoff magic, more than a few observers were calling him the next Ken Dryden. It didn’t quite work out that way. Penney was good but not great during the 1985 playoffs, then tore up his knee early in the 1985-86 season. The injury forced the Canadiens to hand Penney’s starting job over to an untested rookie. That turned out to be a kid named Patrick Roy, who turned out to be pretty good. Needless to say, Penney never got his job back. He was traded to the Jets that offseason, played just 15 more NHL games, and retired at the age of 27. Early in his career, Chris Simon was one the league’s most feared fighters, recording wins over heavyweights like Bob Probert and Tie Domi. Toward the end, he was best known for earning two of the biggest suspensions in league history. But in between, Simon actually had a run as a pretty decent goal-scorer, including a 1999-00 season that saw him score 29 goals. In the Dead Puck era, that total was good enough to lead the Capitals and place Simon in the top 25 league-wide. While it was the only time he topped 20 goals in his career, he hit double-digits in six other seasons and finished with 144 goals over his NHL career. When his NHL run ended, he headed for the KHL, where he was a two-time All-Star and occasionally did stuff like this. Hakan Loob was a Swedish star who had a short but productive NHL run with the Calgary Flames in the late ’80s, highlighted by a 50-goal, 106-point season in 1987-88. You could make the case that Loob doesn’t belong on this list. While he didn’t come close to topping the 50-goal or 100-point marks in any of his five other seasons, he was a consistently good player who recorded three other 30-plus-goal seasons. But I’m including him for two reasons. First of all, his name is fantastic. Go ahead and say it to yourself a few times right now. Hakan Loob. Tell me that didn’t brighten your day. And second, his 1987-88 season actually resulted in him being named an NHL first-team All-Star, beating out Cam Neely. The other five All-Stars that year: Grant Fuhr, Ray Bourque, Scott Stevens, Luc Robitaille, and Lemieux. Five Hall of Famers and good old Hakan Loob. Loob played just one more NHL season, won a Stanley Cup with the Flames, and then headed back home to finish his career in Sweden. Years before he was Young’s teammate in Pittsburgh, Wayne Babych experienced his own one-year breakout for the Blues. A 50-goal scorer in junior, Babych had put up two solid seasons in St. Louis, scoring a combined 53 goals. In his third year, he more than doubled his career total. That would be his 1980-81 season, in which Babych racked up 54 goals and 96 points and played in the All-Star Game. At just 22 years old, it seemed Babych had arrived as an NHL superstar. Instead, it would be easily the best season of his career. Over the next three years he scored just 48 goals combined, and was eventually picked up on waivers by the Penguins in 1984. After one full year in Pittsburgh, he split the 1985-86 season between the Penguins, Nordiques, and Whalers, and was out of the NHL entirely by the age of 28. When you read the premise for this piece, there’s a good chance that Jonathan Cheechoo was the first player who came to mind. Either he’s the NHL’s Brady Anderson, or Brady Anderson is MLB’s Jonathan Cheechoo. We’re still working on nailing that part down. Coming out of the 2005 lockout, Cheechoo was entering his third year and had racked up a total of 37 goals in 147 NHL games. Not a bad start to a career by any means, but not the kind of production that makes you think “imminent Rocket Richard Trophy threat.” And despite a league-wide increase in scoring thanks to post-lockout rule changes, Cheechoo didn’t do much over the season’s first two months. On November 30, he found himself stuck at just seven goals on the year. That date turned out to be important — it was the day that the Sharks pulled the trigger on a trade with the Bruins that landed them Joe Thornton, a former first-overall pick who was considered one of the best passers in the game. Cheechoo was put on Thornton’s line and they clicked immediately. Thornton recorded multi-point games in each of his first six appearances as a Shark, and Cheechoo averaged almost a goal a game over the rest of the season. By the end of the year, Cheechoo had scored a league-high 56 goals, and Thornton had captured both the Art Ross and the Hart Trophy. As much as Cheechoo has become the poster child for NHL one-hit wonders, it’s worth noting that he followed his breakout season with a solid 37-goal year in 2006-07. But that was the end of his run as a top-line player; he’d score only 35 more over the next two seasons combined and then was sent to Ottawa in 2009 as part of the Dany Heatley trade, more as a salary dump than anything else. He scored just five goals in 61 games as a Senator, and despite occasional tryouts and minor league deals, he hasn’t played in the NHL since.